Home / Mother Nurture Knowledge / What IS an aromatherapist? The word “aromatherapist” implies a person who uses aromas in therapy. Yes, that’s true, however as I’m often saying “it’s more than just nice smells”. Anatomy & physiology, chemistry, botany, nutrition, counselling and business skills. The in-depth study of essential oils plus other components used in aromatherapy such as base oils, raw materials, hydrosols and extracts. This includes their properties, uses and most importantly safety aspects. Practical skills including blending and application of aromatherapy treatments. This may or may not include other therapies such as massage therapies, reflexology, kinesiology and beauty therapy. 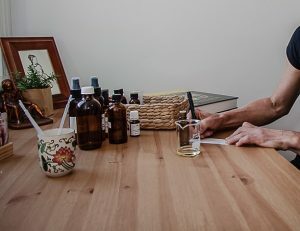 Consulting with perfumers, skin care companies, other health practitioners on the safe and therapeutic use of aromatherapy in their product line or workplace. When we talk about aromatherapy we often think of massage. However there are so many other ways essential oils can be used to enhance our health and wellbeing. There are some instances that may be conducive to consultation and prescription of aromatherapy treatments other than massage such as morning sickness, coughs and colds, skin disorders, emotional issues, menstrual problems, childhood illnesses and more. Whether you’re having a treatment or looking for a personalised remedy, it will always entail a consultation to determine the most suitable treatment path and risk of any adverse reactions. An aromatherapy consultation takes into account your physical and psychological health and may include discussion on medical and surgical history, family history, diet, lifestyle, social factors, previous treatments, sleep and stress management. This ensures essential oils and application methods can be prescribed specific to your needs. Depending on your issue, the therapist will often ask you to “sniff” some appropriate essential oils to help choose the most suitable blend. Many children (and adults!) love this part of the consultation. Like all good professionals, an aromatherapist will know when it’s beneficial to refer a client on to another health practitioner. Often aromatherapists will work closely with other practitioners to get the best results. In the U.K. and parts of Europe, especially France, aromatherapy clinics and the incorporation of aromatherapy in hospital settings are much more customary. * Battaglia, S. (1997). The Complete Guide to Aromatherapy. Queensland: The Perfect Potion.